Zinc (Zn) fertilizers play an essential role in maintaining and/or increasing world food production and improving human health. Many soils of the world are Zn deficient, and crops respond well in these regions to applications of Zn fertilizers, either alone, or in combination with other fertilizers such as nitrogen, phosphorus and/or potassium. Some inorganic fertilizers, however, may contain impurities – including cadmium and lead – at levels that could be inappropriate. Concentrations of contaminants in fertilizers are either derived from the source materials from which fertilizers are manufactured or are introduced into the fertilizer during the manufacturing process. The latter is very uncommon and the dominant source of contaminants in manufactured fertilizers is the raw material used for manufacturing. The International Zinc Association (IZA) is committed to the safe use of zinc fertilizers and to this end partnered with Australia’s Commonwealth Scientific and Industrial Research Organization (CSIRO) to develop a set of fertilizer contaminant limit values for arsenic (As), cadmium (Cd), chromium (Cr), lead (Pb) and mercury (Hg) in zinc fertilizers. Based upon the Code of Practice for zinc fertilizer developed for the International Zinc Association (IZA), Table 1 sets the specifications for the limits of impurities in zinc sources for use in fertilizer. Table 2 provides the minimum level of zinc in common zinc fertilizer products. The Seal of Approval will be granted on a conditional basis once the product specifications and 1st quarterly analysis are provided and deemed to meet the requirements. A company’s use of the Seal can be stopped at anytime if the audit requirements, and standards, listed above are not met per the assessment of the IZA. 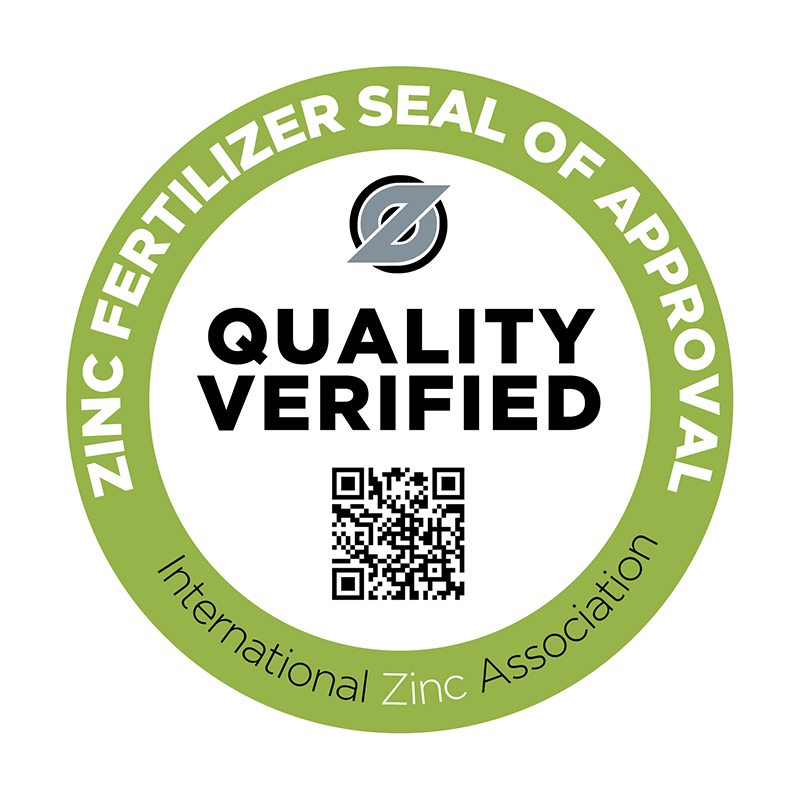 For more information about the Zinc Fertilizer Seal of Approval, please complete the form below. *The information contained in the Code of Practice and any documentation in relation to the Quality Seal only comprises statements of a general nature based on scientific research. Such information is not intended to address the specific circumstances of any particular individual, entity, purpose or situation. IZA does not owe any duty of care to you, and makes no representations or warranties of any kind, express or implied, about the completeness, accuracy, reliability, suitability or availability of such information for any particular purpose or situation. Any reliance you may place on such information is therefore strictly at your own risk, and no reliance or actions must be made on such information without seeking prior expert professional, scientific, and technical advice. Except to the extent such liability cannot legally be excluded, IZA (including its employees, consultants, and Members) shall in no event be liable to any person for any consequences whatsoever, including but not limited to any losses, damages, costs, expenses or any other compensation, arising directly or indirectly from relying on the Code of Practice, any documentation in relation to the Quality Seal (in part or in whole) and any information or material contained therein.